In the heart of Biarritz, ideally located in a small street, La Villa Maurice is a mansion completely renovated in 2014. Opening on terrace. The T1 is near the beach (200m), shops, market, places of interest, restaurants. When you put down your car or get off the train or plane everything can be done on foot. . It includes a kitchen, a bathroom toilet, and a main room overlooking a terrace. Bedlinen with duvets provided (bath towels not included). Possibility of free parking at 10min; Internet included in the rental. Etwas kleiner als gedacht, dennoch soweit alles gut. Die Lage war sehr gut, die Wohnung hat einen Balkon auf dem man auch zu dritt recht gut sitzen kann. würde man sich vielleicht einen zweiten Raum wünschen. Bad und Küche waren soweit super. Preislich wären andere Wohnungen teurer gewesen, sodass wir mit unserem Besuch recht zufrieden waren! 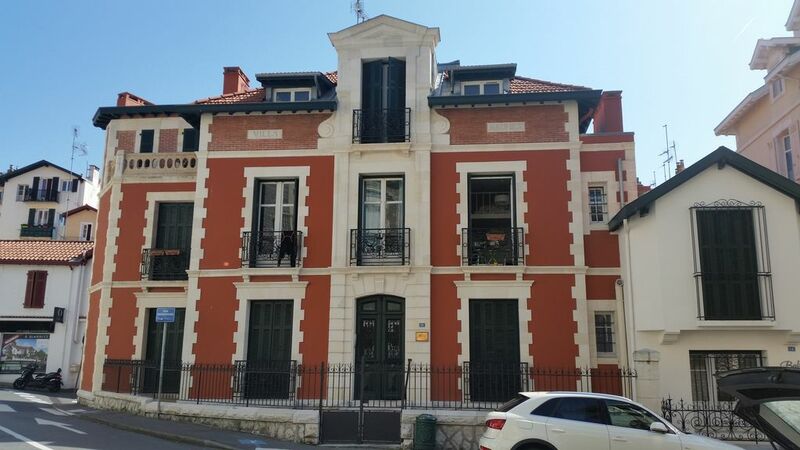 If you want to stay in Biarritz right in the heart of the town this is the place for you. My wife and I stayed here for one week and it was perfect to enjoy Biarritz at its most convenient! If you know Biarritz, you will know there are great restaurants, boulongers and shops right on your doorstep. I stepped out every morning to the bakery at the bottom of rue jean bart and we had breakfast on the balcony. Often we finished the day in Bar Baskus on rue helder. The apartment was very well equipped, plenty of space and the double glazing kept out the noise. Madame North was very helpful and welcoming, and works in the city centre so can be contacted if anything goes wrong (though it didn't!). All in all a perfect spot for a city centre sojourn. Beimid ar ais! Si vous voulez rester à Biarritz en plein cœur de la ville, c'est l'endroit pour vous. Ma femme et moi avons séjourné ici pendant une semaine et c'était parfait pour profiter de Biarritz plus pratique! Si vous connaissez Biarritz, vous savez, il ya d'excellents restaurants, boulangers et commerces à votre porte. Je suis sorti chaque matin à la boulangerie en bas de Rue Jean Bart et nous avons pris nos petit déjeuner au balcon. Et nous avons passé le fin du soirée à Bar Baskus (Rue Helder). L'appartement est très bien équipée, beaucoup d'espace et le double vitrage. Mme North nous a donné un accueil chaleureux et était très serviable et informatif. Elle travaille dans le centre-ville, donc être contacté en cas de problème. En général un location idéal pour un séjour en centre-ville. 5mn de la plage trés bonne situation"
Restaurant Café du Commerce, Market Bar, Clos Basque, Columns, Admiral, 100 steps for aperitif, night market from 15/07 to 31/08, surf lessons and lessons, golf courses, Spain nearby, San Sebastian 25 min by car, bus or Topo (train) from Hendaye, villages of the Basque Country (the 5 most beautiful: Ainhoa, Espelette, Itxassou, Bidarray, St Jean Pied de Port), Fontarabie and its medieval city.